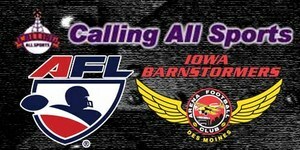 05/05/2011 3:41 PM - DES MOINES – The Iowa Barnstormers in conjunction with the Arena Football League are pleased to announce that they have reached a groundbreaking partnership with Calling All Sports for the remainder of the 2011 season. The agreement will put the AFL on a national platform as the league will be featured on Calling All Sports “Football Saturday Night” program, which airs from 7:00pm – 12:00am on over 400 stations nationwide and over 500 stations internationally as part of the American Forces Radio Network, on Sirius/XM Satellite and streamed live on the internet. Veteran sports broadcaster Marty Tirrell will serve as host and play by play announcer for all of the live AFL game action. Tirrell brings over 20 years of experience and currently serves as the host of the Mouth of the Midwest sports radio show that is broadcast locally in Des Moines, Iowa and host of the Calling All Sports radio show, which is broadcast nationally and internationally via Sports Byline USA Network media distributions. Trent Condon will join Tirrell and provide analysis and support. “Football Saturday Night” will be a 5 hour show which most nights will feature live AFL action the first part of the show, followed by post-game reaction, plus interviews and features with individuals throughout the world of football. The tentative air schedule for the remainder of the season is listed below. As always, for all of the latest Barnstormers and Arena Football League information be sure to log onto www.theiowabarnstormers.com.